Describe the Marketing Research Processes? This market research study was conducted to determine if Eleganté magazine an exclusive luxury lifestyle magazine should expand its distribution region from UAE only into the entire GCC region. The research method uses a combination of qualitative in depth client interviews and quantitative research for competitor pricing and distribution numbers and reach. The results of the research study will be analyzed to answer the MDP "Should we expand our distribution to cover the entire GCC region?" for Elganté magazine. The study takes three components of the MRQ to derive interview questions. The research study explains the methodology used for the interviews, who and how the interviewees were selected. The summery of the results then is analyzed to determine whether it would be feasible for Eleganté magazine to expand its distribution to cover the entire GCC region instead of the current UAE only distribution. The decision will be based on the perceived demand and projected financial gains. History: Elegante’ magazine was founded in 2009 in Beirut Lebanon. In 2011 the publication was introduced into UAE. In November 2014 there were some management changes and an overall haul of the magazine. Nature of Business: Quarterly published Luxury lifestyle magazine, target audience are high net-worth individuals who are interested in luxury brands and items. The range covers UAE locals and expats, male and female readers between the ages of 35 to 60. The Elegante Magazine is engaged in covering the stories of celebrities, big business tycoons and youth figure of style. Location: IT Plaza, office 916, silicon oasis. Dubai. UAE. Size: 7 working full time staffs and freelancers when needed. Competitive position: Most luxury lifestyle magazine in the UAE covers the entire GCC region, Elegante’ focus is to only cover UAE. Target market: Elegante’ magazine’s target markets are the UAE high end businesses, segments which includes luxury automobiles, high end fashion and jewelry, 5* hotels, resorts and spas. The magazine is well popular among the youth and business tycoons. Therefore, it targets the big brands name and personalities to increase their sale and brand value. Company performance level: Elegante’ magazine's sales currently is underperforming and is not being profitable. Main competitors of Eleganté are, The Rake, Esquires, and Simply Abu Dhabi magazines. Eleganté has a low percentage of repeat clients which is the primary reason for poor financial performance. Therefore, the low performance of the business is affecting it to maintain their market share and customer base. Moreover, the tough challenges from the competitors are hampering the Elegante magazine to maintain its growth rate. In order for Eleganté to improve sales and profitability they have to discover the reasons why most clients do not choose to place repeat adverts with them. Should we expand our distribution to cover the entire GCC region? To determine how attractive it is to clients if distribution expands to cover the entire GCC region. i. What are the benefits of the proposed expansion for clients? Decision outcome: upon completion of our research we will show the benefits offered to clients from expanding distribution to cover the GCC region. The expansion can be valuable for the magazine to reach out to large number of readers and customer circle can be increased. Moreover, the magazine can be able to place itself competitively in the magazine market in UAE and other areas. Decision outcome: upon completion of our research we will know which UAE clients see Eleganté as a better value, when servicing the GCC region. The clients can be able to invest in the magazine that can improve the sale of the magazine in future and it help in generating profit margin. Decision outcome: upon completion of our research we will have determined if there is a demand for luxury magazines in other regions of GCC. Therefore, it can be considered that Elegante can be able to pull the audience from the new region that can increase their value and visibility in the market. The research approach can be effective for the research work so that purpose of the research can be fulfilled. The researcher can go for deductive approach as it can help the work to get accomplish in productive way. The existing theories can be used that can relate to the research paper and it can be modified as per the requirements. Therefore, inductive approach may not be as appropriate as the deductive approach (Bergh and Ketchen, 2009). On the other hand, the researcher may not have enough skills to introduce the new theories or concepts. Thus, the deductive approach can be effective in the practical employment of theories for the particular research paper. The chosen is positivism as subject of philosophy in applications of logic that help analyzing the hidden facts and information in scientific manner. Positivism tries to reject metaphysic so that details knowledge collections in enabled. Positivism is applied in the current context of the study which helps in better analysis of hidden facts and information related to the marketing research process along with consumer buying process (Bernard, 2011). However, nature of the study is time limited so interpretative and realism study is discarded as being the choice of research philosophy. Further, selection of positivism philosophy limits the researcher roles in manipulating or evaluating the data that leads to minimization of data errors as well. The research approach will be mostly be done in form of in depth interviews conducted with clients and potential clients of Eleganté magazine. In addition there will be some quantitative research done to determine the demand and audience for luxury magazines. There will be a combination of exploratory and conclusive research. The clients of Eleganté are high end brands and establishments, the point of contacts always are the organizations marketing managers and decision makers. The only feasible approach to our research study will be direct in depth interviews (Bryman and Bell, 2011). As the subjects are professional peers in the marketing field they would be aware projective techniques and trying to use them would come across as disrespectful and will be ineffective. As each of the clients is extremely busy with limited time and specific needs conducting a focus group would also be ineffective. A focus group would be too generalized and time inefficient for this group of professionals. A direct in depth interview will offer a clear and effective means to provide the clients with an opportunity to answer open ended questions, shedding light to complex needs and behaviors. In addition their input will be a great source of information as they would have no reason to hide or mask answers to their opinion on Eleganté expanding to a wider region. After all every marketer is interested in reducing their CPM (cost per thousand) and would want to be helpful to achieve lower CPM. Clients of Eleganté are exclusive high end clients limited in number, catering to the crème de la crème of our society. When dealing with high end people and organizations service becomes a key component to attracting and closing the deal. In order to increase repeat clients for Eleganté only in depth interviews can provide the necessary information to adopt strategies and solutions to meet their needs. As the readership of Eleganté is the target audience the advertisers will be reaching out to, it becomes relevant to conduct qualitative research to determine the demand for luxury magazines in the rest of the GCC region. Our study will research the luxury consumer market in the rest of the GCC as well as Eleganté's main competitor’s market share and pricing structure. 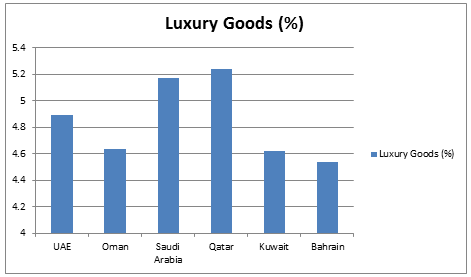 The data on the GCC luxury market will be obtained from industry reports and the pricing structure data will be obtained from primary market research. The research errors will be limited as the qualitative data will come from sources that have vested interest in providing accurate information and the quantitative data will come from reliable secondary sources (Burns et al. 2008). The primary data for competitor information is data available readily to anyone interested in using their services and will be accurate. Exploratory research was conducted in form of in depth interviews with twelve marketing managers who are the policy makers and project implementers in a two month period. These marketing managers act as gateways to the higher level stakeholders who the final decision power of approving or disapproving the placement of the adverts (Cooper and Schindler, 2010). However on most cases the high level stakeholders rely on the recommendation of their marketing manager for their decision regarding marketing expenditures. Eleganté magazine is in a unique position compared to other high volume transaction firms. The current client database consists of approximately two hundred clients with around sixty of them being active clients (Eleganté manager). The remaining clients have sporadically placed adverts with Eleganté magazine. The advertisement placement cycle is long with Eleganté as there are only four issues printed within a year. Due to this long cycle and the relatively small number of clients Eleganté magazine sales team has ample time to meet with clients to strategize and follow up. During these meetings a strong and open relationship has been established with the clients, it is due to this relationship that each of the interviewees did not deem it necessary for Eleganté to provide a confidentiality clause or consent form. The study requires only primary sources of information’s which helps the topic in extracting the information from the employees of the organizations. The first hand data collection however needs clarification of reliability and validity. In case of secondary data sources , data are used a widening the concept of research that also enables better study of the topic as it involves more data and description (Corbetta, 2009). Information applications: data gained via topic will helpful in understanding the present trend of the marketing management strategy used by the various organizations. The manager of the Eleganté has been chosen for the organizational success. However, any commercial applications of the data will be able avoided so that the findings can be strictly limited to academic purpose only. Respondent’s participation: The researcher tried to insert no external influence on pressure over the respondents for taking part in the feedback process of the research topic. Respondents with as sense on voluntary participation were encouraged to participate in the following topic (Burns et al.2008). Respondent’s secrecy: It was ensured that any form if mental or physical harassment was not involved with the respondents so the identity of respondents were covered as per the request for participants (Cooper and Schindler, 2010). Based on the above mentioned list of ethical consideration, the researcher tried to maintain the basic research ethics. Although the Eleganté interviewer could have conducted their interview without announcing that they were doing so and the information needed could have been collected as part of their usual meetings, for ethical reasons the client was made aware their responses would become part of a research study and were offered a written confidentiality agreement and consent form. Every interviewee declined the written agreement and was content by verbally asking to remain anonymous. The strength of the relationship and the non sensitive nature of the interview were the reasons why the interviewees were comfortable and willing to share their answers with the Eleganté interviewer. The assumption made by the interviewer is that the interviewee will have no motivation to disclose inaccurate information. This assumption is made due to two important and relevant facts, the existing positive relationship and the non sensitive nature of the interview subject. Another fact helping the integrity of the answers is the direct benefit to the client by expanding the distribution region which reduces the CPM. From the twelve interviews six were conducted with repeat clients and six with non repeating advert clients. From each group half of the clients have market presence in the GCC region while the other have only operate in the UAE. This sampling was done to cover the four possible combination of client specification. Eleganté magazine interviewer had 10 questions to explore. The initially factual questions were used followed by opinionated ones, all the questions were open ended and probes were used when necessary. The protocol of the interviews was standardized, informal without using any recording devices. The interviewer used notes with follow up notes after the interviews. The opening and closing of all the interviews were also standardized to maintain a consistent format. In order to answer the three components of MRQ the following questions were asked. The four variations in the question were tailored for UAE only market, GCC market, repeat and non repeating clients. What are the benefits of the proposed expansion for clients? Decision outcome: upon completion of our research we will show the benefits offered to clients from expanding distribution to cover the GCC region. Decision outcome: upon completion of our research we will know which UAE clients see Eleganté as a better value, when servicing the GCC region. Have you found the fact that Eleganté only distributes their magazines in UAE as a limiting factor for your marketing needs? This component used quantitative research. The present chapter described the various research tools of selection that can help in better analysis of the topic. With the help of this chapter, the researcher tried to align the nature of the study along with the available research techniques so that possibly the best research methodology is framed. The tools more appropriate to analyse the concepts of present marketing trend for the Eleganté magazine.